C R K Stable’s Candy Boy and jockey Gary Stevens pose in the winner’s circle after their victory in the Grade II, $200,000 Robert B. Lewis Stakes, Saturday, February 8, 2014 at Santa Anita Park, Arcadia CA. 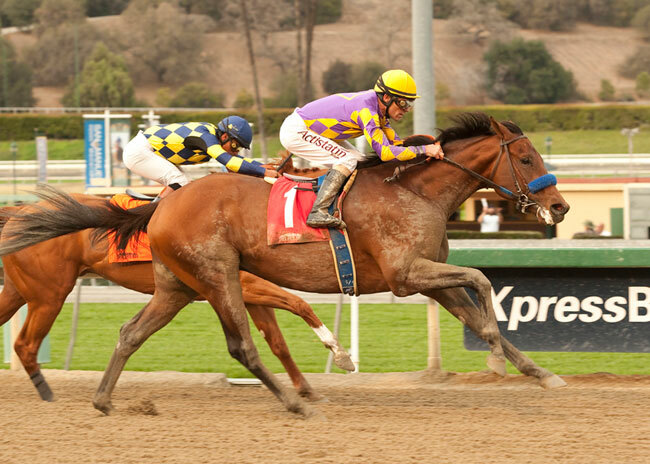 Candy Boy Proves Experience Pays Off with a Win at the 2014 Robert B. Lewis Stakes: The Robert B. Lewis Stakes took place at Santa Anita Park with 7 entries today, Saturday, February 8th. 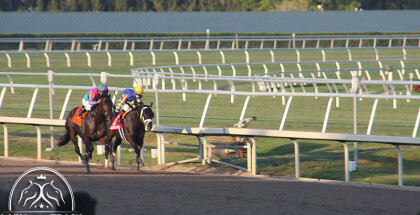 The race is 1 1/16 miles long and is a grade 2 race for 3-year-old colts. The Robert B. Lewis Stakes is another stepping stone to the Kentucky Derby later this year, with the winner gaining 10 points for the Derby. 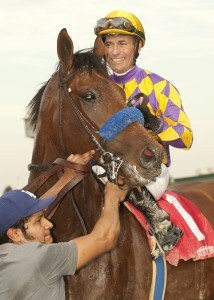 Going into the Robert B. Lewis Stakes Midnight Hawk was a favorite, as the winner of the Sham Stakes in January. However, it was Candy Boy who took the win and the $200,000 purse. Candy Boy won by less than a length. Diamond Bachelor took lead early on with Chitu and Midnight Hawk rounding out the top three in the first part of the race. At first it seemed like Candy Boy was falling behind and stalling out a little bit, but in the stretch he was able to kick in to high gear and won with a time of 1:41.83. Though Midnight Hawk was the early favorite going into the race, Candy Boy has a lot of experience and that experience proved to be an asset for Candy Boy, though the Robert B. Lewis Stakes was only Candy Boy’s second start on dirt, he has had 5 starts overall. This is Candy Boy’s first graded stakes win. 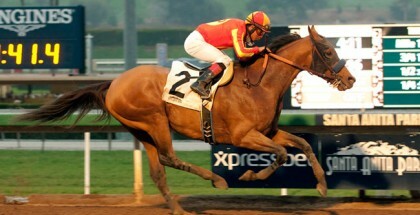 Candy Boy is owned by CRK Stable LLC and trained by John Sadler. Candy Boy’s jockey for the 2014 Robert B. Lewis Stakes was Gary Stevens who had Candy Boy take a more relaxed approach in the beginning of the race, before pushing Candy Boy to battle it out with Chitu before moving on for the win. 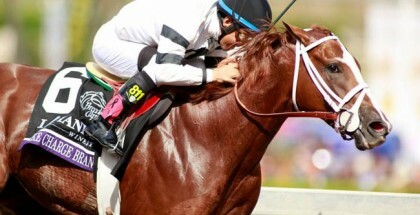 Candy Boy will be one to watch in the upcoming months on the way to the Derby. C R K Stable’s Candy Boy and jockey Gary Stevens, outside, overpower Chitu and jockey Martin Garcia, inside, to win the Grade II, $200,000 Robert B. Lewis Stakes, Saturday, February 8, 2014 at Santa Anita Park, Arcadia CA.